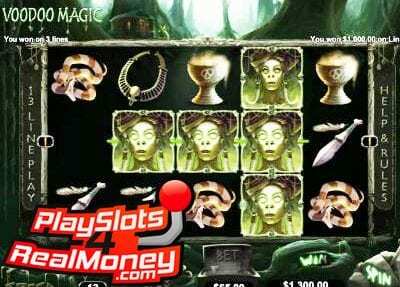 Voodoo Magic Slots is a five reel, thirteen-payline video slot machine that is powered by Real Time Gaming software. This was released in 2015 around Halloween time and has a horror theme; scatter wins, a multiplier, a wild symbol, free spins but does not have a progressive jackpot or a bonus game. Make sure that you claim the biggest and the best online slots bonus by clicking through our links and banners on the right-hand side of this review page when you sign up for a USA friendly Bitcoin or credit card casino. Just like most of the other games powered by Real Time Gaming (RTG) software, all of the wins payout from the left-hand side of the screen to the right-hand side of the screen. You can bet as little as one penny per spin and as much as sixty-five dollars per spin when you are wagering the maximum. The symbols that you will see when you begin to spin the reels playing Voodoo Magic online slots for real money are scary. Enjoy watching the skull, knife, jar, necklace, voodoo doll, snake, candles, goblet, coin, Priestess, and other traditional poker playing card symbols. Keep your eyes open for the voodoo dolls and the Priestess icons as they are the most important symbol in this online slot game. The voodoo dolls are the scattered symbols, and the Priestess is the wild icon. When you land the Priestess wild image, he will help you put together real money winning combinations and replace all of the other symbols on the wheels. The only icons he will not replace are the Voodoo Dolls as they are the scatter symbols. When you land two or more of the Voodoo doll scatter symbols on the reels from the left-hand side of the screen to the right-hand of the screen, you will trigger the bonus round where you will win some free spins. During this series, you can activate the magic multiplier, which can bring you home some sweet cash plus you can win up to another twenty-five free spins. Overall we do not feel that this is the best online slots game that Real Time Gaming (RTG) software has released but it was fun to play, and there are some decent wins. We are not a huge fan of horror-themed games, but if you like them, then you may love to play Voodoo Magic online slots for real money with no download in an instant. Real-time gaming does a good job developing this horror-themed game. You don’t have to like, be a fan or practice voodoo in order to get big wins on this online slot machine. Overall, “Voodoo Magic” includes items to practice black magic such as spooky charms, snakes, skulls, eyeballs, Voodoo Masks, sacrificial knives, and some fire-powder. Don’t get carried away because some of these symbols payout very well(refer to the pay table). In addition to this game containing spooky items that allow folks to carry out voodoo and/or black magic, you can score big multipliers and meet the Wild Priestess. Beware of the Wild Priestess as he may bring about some big wins by replacing icons but may show you how to practice black magic.